We used to own a home in Angel Fire back in 2003-2004, which we never ended up using much in the winter, so we only have a few days skiing there. The runs are generally pretty easy, so it was a good place for the family, but it was just too difficult getting there for us to get much use out of it. Angel Fire is located in northeast New Mexico in the Moreno valley, about 23 miles east of the town of Taos. 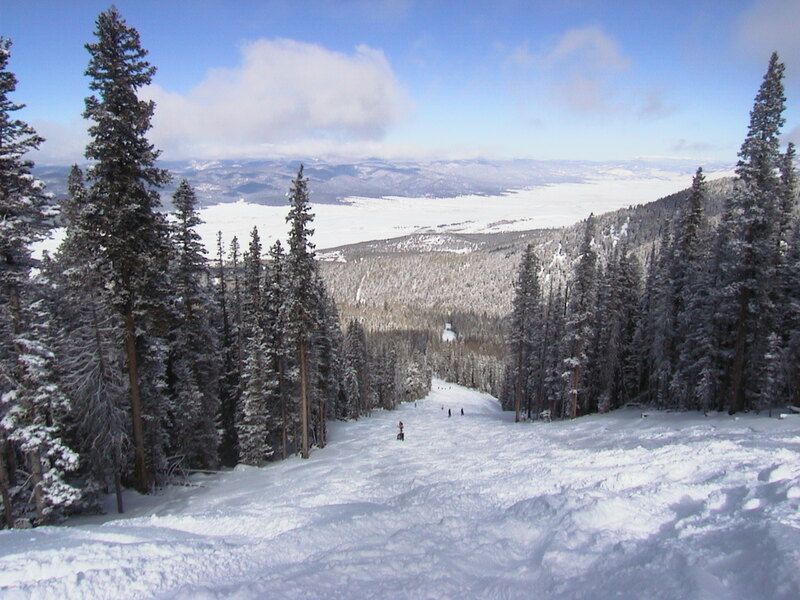 The resort is very popular with skiers from Texas, Oklahoma, and Kansas because it is the one of the closest resorts to those states, and it is much easier than Taos. The town’s business district is very small and spread-out along the main road, but there are seemingly endless roads laid out in lots for real estate that has either been developed or will be developed in the future. There is a small village at the base with restaurants and a couple of shops. The ski hill is serviced by 2 main lifts, with a very long high-speed quad on the front side and a shorter one on the back side. The runs on the back are shorter and a little steeper. The pictures here were taken February 14, 2002 and the snow conditions were great with fresh powder. For the average skier, Angel Fire has lots of easy blue cruisers. The views of the valley and the highest mountain in New Mexico Wheeler Peak are spectacular. For a small resort, having 2 high speed quads serving all of the terrain is a nice surprise. Lack of snowfall is the biggest problem. 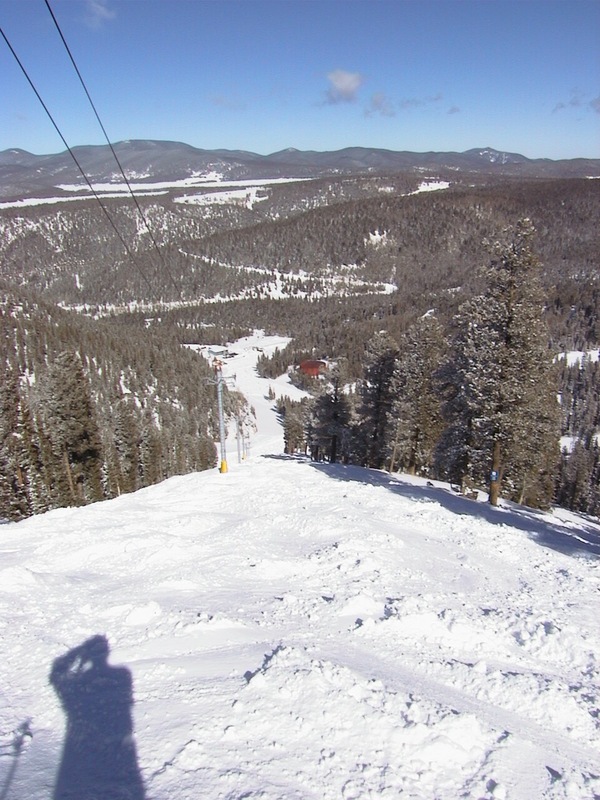 Nearby Taos Ski Valley gets about 100″ more snow per year on average. Angel Fire claims to have 53% of the slopes covered by snowmaking, but they don’t seem to be using it fully if that is the case. Angel Fire can be really cold and often has the lowest temperatures in New Mexico. There is really not much to the town, so driving in to Taos for shopping and eating is something most visitors end up doing. Easy trails are great for low intermediates, but there is not much there for advanced skiers. Crowds can get epic on holiday weekends. There are a couple of black runs on the upper part of the mountain — Maxwells Grant and Silver Chute, which are quite steep and fun, and had abnormally good coverage when we skied them. This resort is just too easy and limited for us to ever want to go back — especially with the super iffy snow conditions that plague New Mexico. 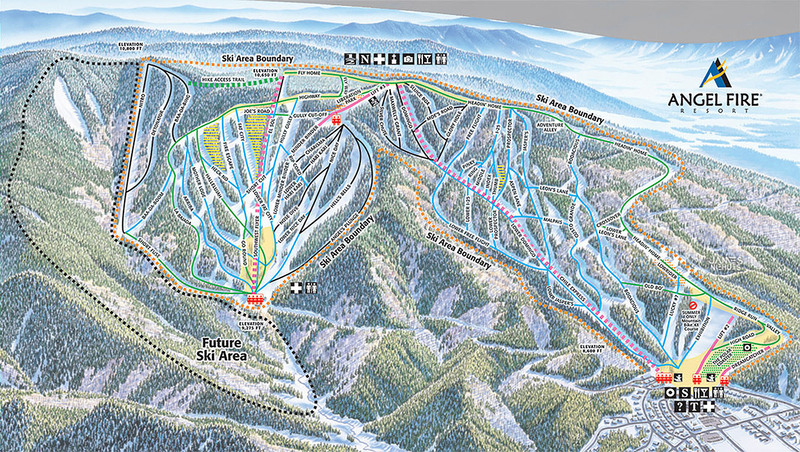 For us, Taos Ski Valley is a better choice with more snow, vertical, and terrain.